After having dismantled my previous layout, I have started to build a new layout, that will be controlled with several Arduino Mega's plus several Arduino Nano's controlling points and other bits and pieces. About 2/3 of the track is laid and bits and pieces of the scenery is in all stages of construction. The centre piece of the layout will be the area around the common I have included some photo's of the area, It is Tudor based. The pub sign is 3D printed, as is the roundabout in the playground, the florist pots, the phone box. Will post more photo's when I have converted then to a smaller format. As usual any questions please ask. Have had trains running end to end, as that is all the track I have that is usable in the middle travels at a constant speed then when it reaches the end trips the first sensor and gradually slows down, then trips second sensor and stops waits a few seconds then gradually accelerates in the opposite direction, then goes to other end and does the same thing. The circuits and software will be available if anybody is interested in it. The pub on the common The Loose Cannon. Incredible detail, so good to not see 'recognisable' known manufacturer! What is the playground made from? Welcome to the forum, great to see someone who is really adept using a 3D printer. If you have the time and don't mind doing it, I, and I guess most of us here, would welcome some "how to"s and and "talk throughs" on how you do it. Edit Don't ask why I didn't remember the ones you had done previously. Too much time exterminating would be Russian Trolls and Spammers. Very nice work. The pub sign really demonstrates the ability of the 3D printer. Does your layout have a name? I have always liked Tudor/timber framed buildings, and these look excellent. I am envious of your Arduino skills, as I find it difficult to compile sketches. Have you seen any to control two level crossing gates ? How absolutely unique!! The only thing I can recognise are the purchased figures. Now....How about setting up a cottage industry so we can buy some of your unique 3d prints off you. E2E, I think, looking at some of timbologist's earlier work, it's not jut the 3D printing we may be commissioning - he/she does a fine line in custom moulded parts too! Timbologist - after a quick flick through your last build and your thread in the welcome section, I'm looking forward to following this with interest. look into making a kit of parts for making some buildings. I am envious of your Arduino skills, as I find it difficult to compile sketches. Have you seen any to control two level crossing gates ? Buggleskelly If you PM me with your email address I could have a look at this for you. Below is a link to a Youtube video of a point motor using a cheap SG90 servo plus an Arduino Nano to control it which would be ideal for your crossing gates. TimberSurf the monkey bars are made from some brass ladder out of my bits and pieces, same for the ladder on the slide, the slide section is made from copper wire with foil from a milo tin glued to it. The swings are made from different sizes of copper wire with wooden seats. And the roundabout the pipe section is 3D printed and the bass is from timber. V.R please explain this for me. and at the moment I do not have a name but working on that. Here is a photo of something I have been playing with that is trying to get signs that look like they are painted onto stonework and look old and weathered. There must have been a thing at one stage for tudor=esque shops in Melbourne early 20thC, There's a set in Commercial Rd, Prahran, another in Burke Rd Camberwell. 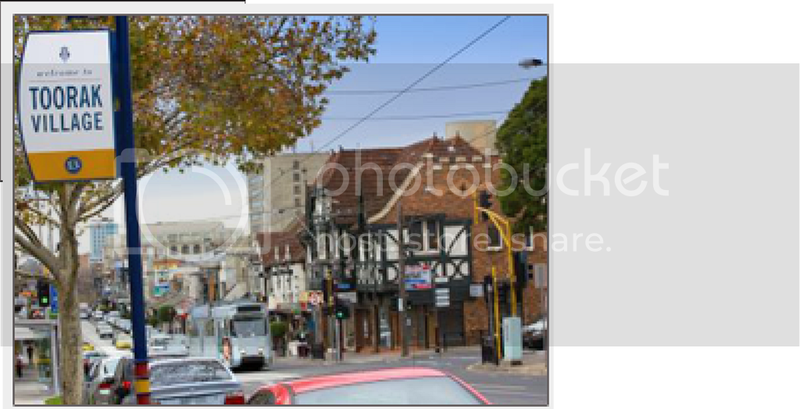 Elsternwick has another set. I have not been down that end of Melbourne for that long I could not say that I have or have not seen them, I grew up in the Northern Suburbs, If I ever go that way will have a look at them. Been writing some code today for Arduino A1 which is the first slave controller. The throttle and block detection modules have been installed for this controller. First photo is the 3 slave and master Arduino's mounted on there board, easy to get to mounted on side of layout. The second photo is of one of the throttle detector units, left and right are the block detector units, centre back is the board with the power and the network cable to the slave Arduino. The centre front is a L298N Dual Full-Bridge Motor Driver that is PWM driven. third group of 3 is the direction that the block will be set. fourth group can be 1 to 3 characters as this is the speed to be set. The above will probably change at a later date as I add more features one of those is that the points contained in the slaves area will also be controlled with this command structure, which will then be relayed to other smaller Arduino's. It's a slow process making sure everything lines up from hardware to software. I do one thing at a time or you end up in a big mess, and of course write it all down, have a folder full of notes and scribbles. Currently waiting for more track to arrive so I can start on the missing half of the layout. Here are a few photo's of the end of the layout that has had all the track laid, the first photo shows where the track goes from the main room into my work room, the last photo is where it goes through the wall in the work room back into the main room. The tracks at the moment go through the wall and stop in mid air. The track arrived today to start on this missing piece. The hole in the layout is the access hole where the Tudor shops and the common lives. The back corner will have a stone castle, which you can see bits off, and no the bottle kilns won't be in the middle of the castle. The left side has the school, and front is another Tudor building , and the watermill on the stream. Have more general photo' will up load then I will start sorting out some detail photo's of what I have been doing and how I have done it, As can be seen I have a long way to go. Unfortunatly I don't. But I did have a peruse of the links. One thing that is really puzzling me is how to mount a SG90 servo under my basebaord vertically so I can swing a gate. I saw your SG90 video on point changing but never saw how you had mounted it. Although for a point I'm assuming it's mounted sidways? End2end wrote: One thing that is really puzzling me is how to mount a SG90 servo under my basebaord vertically so I can swing a gate. Yes they are mounted sideways but as you can see I changed the direction with a rod and another lever, so I could use more throw of the servo but move the point less sort of geared down. I used my laser cutter to make the brackets from 3mm perspex, but I will be uploading a version to 3D print onto Thingiverse so all you need to make is the rod out of a paper clip. To swing a gate I would mount the servo vertically and probably drive it with gears and the driven gears shaft goes up through the board to mount the gate on. Or just use levers and a rod, you would have to experiment with the lengths because of the 90 deg movement of the gate. I over cooked the little lever as I had put holes to close to the edge.